It’s always difficult to watch films about the Holocaust, and it’s especially challenging to write about them afterward. What can be said about one of the most horrifying events in all of mankind? 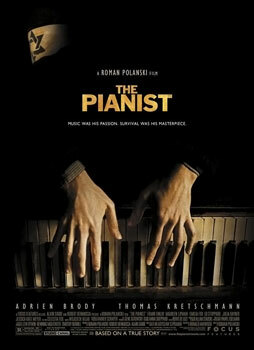 Because of this, it has taken me ten long years to finally see The Pianist, Roman Polanski’s film based on the World War II memoir by Polish-Jewish musician Wladyslaw Szpilman. Adrien Brody stars as Szpilman, and the film begins with a German bombing during one of his popular radio station performances. It doesn’t take long for Germany to defeat Poland, and they quickly begin pushing the Jews into ghettos with extremely poor living conditions. This only gets worse as the Germans linger in the country, with Jews being executed randomly, and many of them being sent to concentration camps. Eventually Szpilman becomes separated from his family, and he is forced to live in hiding from the Nazis. He must rely on the hospitality of others, but this becomes increasingly difficult as the war goes on. Jews begin turning on each other, and the Nazis start wiping out entire areas for no reason. Soon many ghettos are looking like post-apocalyptic war zones. This destruction makes for an exceedingly arduous viewing. The punishment is relentless, and quite frankly we do not need to see most of it. The devastation and tragedies just keep getting piled onto Szpilman with no end in sight. There is no humanity or compassion at all, except for a brief glimpse at the end. It’s harrowing to watch, a painful look at an absolutely darkest time. The attention to detail in The Pianist is astounding, and this is to be expected given Polanski’s own Holocaust survival tale. This is an extremely well-crafted film, one brought together by Adrien Brody’s well-deserved Oscar-winning performance. Szpilman’s physical and mental deterioration over the years is hard to watch, but Brody’s dedication to the role is admirable. While watching The Pianist, I wondered what separated Szpilman’s story from thousands of others during the Holocaust. Was it the fact that he was a well-known musician? Or perhaps that he received a rare moment of compassion as the Nazis left Warsaw? Ultimately, this question does not matter. At the end, this could have been the story of any number of survivors, and The Pianist is an exemplary portrait of this. Excellent post, I have been meaning to watch this for ages. I dont blame you for taking so long to watch this. This is an exceedingly difficult film to watch, just because its such an unflinching portrait of what people were put through during the Holocaust. So heinous. It’s heartbreaking. Brody was great here, and Polanski, too. Both deserved the awards they won. Yeah, I can appreciate this film, and it really is a great one, but I wasn’t exactly excited to give it a watch. To be honest, I felt dirty slapping a score onto the end of this post. How can you really rate something like this? Glad you finally watched this. An underrated film IMO and it’s truly mind-boggling how much the human mind can take and still survive. Good review Eric. Thanks man. It really is a phenomenal survival story. I hear ya, Nostra. A tough watch, but the end is especially moving. Such a powerful film! I watched a documentary called Roman Polanski: A Film Memoir this year, and he talked about how scenes from The Pianist are based on his own life. In fact those were the most interesting parts of the doc. Probably would make a good double feature, though the holocaust is pretty dark subject matter, as you say here. Hmm, wasn’t aware of that documentary. Yeah, there are some truly great films about the Holocaust, but I can’t say I’m ever eager to see any of them. So hard to watch. 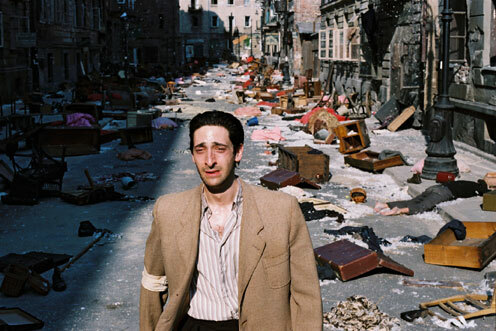 I think The Pianist is remarkable in how it portrays the protagonist as no more than a regular person surviving the ordeal without a single act of heroics. There’s nothing special about what he did to stay alive, just a keen sense of where to be, how to keep a low-profile and a ton of luck. The randomness of the Nazi killings made the tragedy all the more harrowing simply because no matter what the Jewish people did, there was absolutely no certainty of whether they’d live or die. Very well said, Niels. I imagine this story wasn’t much different than countless others during the Holocaust, but that’s a big part of what made this film so effective. No heroic efforts, as you said, just extraordinary survival.